Sunlight glints off a beautiful, elevated sapphire star. 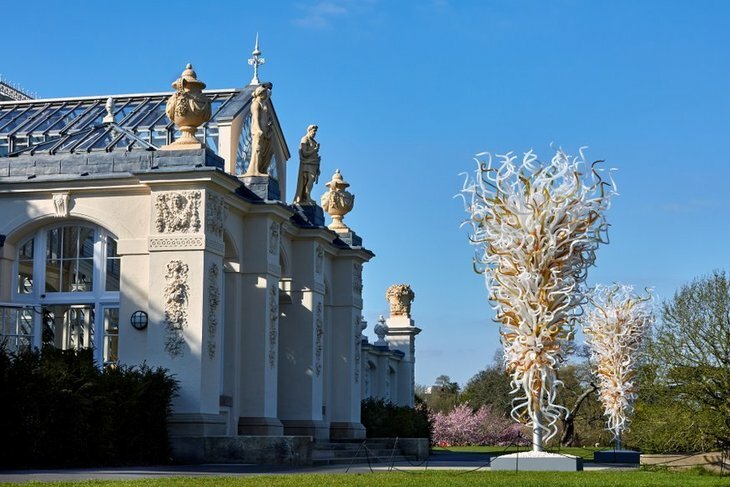 On the green grass and under blue skies, the delicate glass sculpture looks both in harmony with its environment and as if it's been mined from the depths of an alien planet. 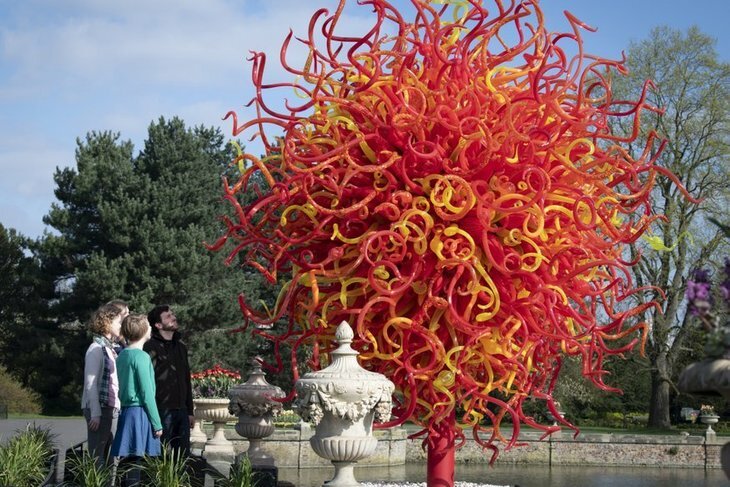 It's the creation of glass sculptor Dale Chihuly, and is one of over 30 works scattered throughout Kew Gardens in a spectacular outdoor exhibition. Elsewhere in the grounds, a yellow and red tentacled 'sun' is reflected in a large pond, so bright it wouldn't be a surprise to see the nearby water evaporating. A tall spiky tower explodes out of the ground, looking like it could keep growing upwards in line with the trees that surround it. The trail continues indoors, where snaking works emerge from the waterlily pond, like mutant offspring of the usual residents. A gnarled blue piece delicately hangs from the ceiling in the Temperate House like an organic chandelier, not dissimilar to Chihuly's piece in the V&A's atrium. Chihuly's sculptures have always had something of the natural world about them, like they would keep growing if nobody was watching them. Here, among the botanical wonders of Kew Gardens, they're far more at home than they would be in a gallery setting. 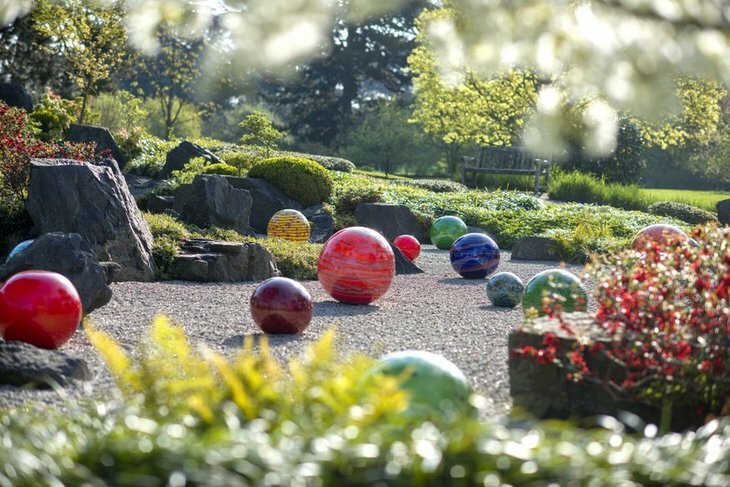 There's an impressive amount of thought in how the works have been placed around the grounds, with colourful spheres placed in gravel as if they're all part of the same solar system. The more plant-like works are often placed in among other plants so on quick glance, they could be a rare species of flower. On a sunny day under blue skies, Kew Gardens very relaxing. 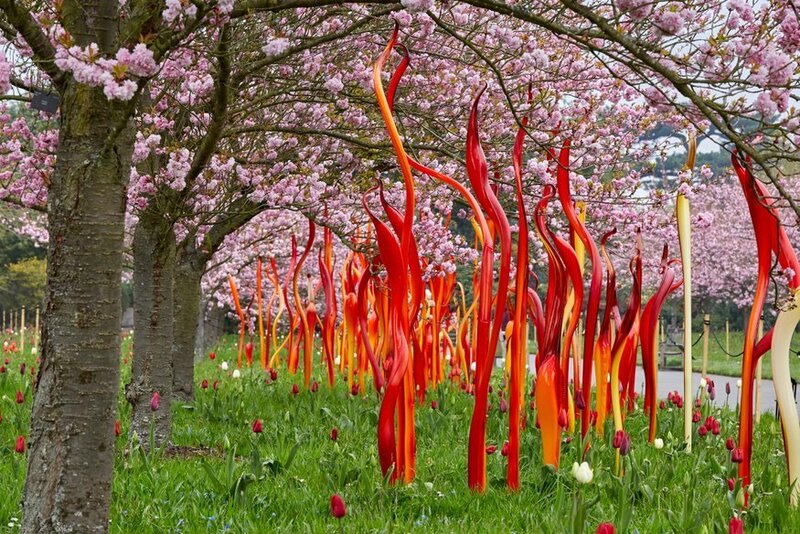 With the addition of Chihuly's sculptures, this summer at Kew just got prettier and more magical.